In the fast paced world we live in, most of us could no longer afford the luxury of staying in bed for 2-3 days after any cosmetic procedure, thus silicone implants now have their greatest rival, the fillers. In as little as one hour (most of the time less), one can go out of a cosmetic center, looking younger and refreshed. Hyaluronic Based Fillers are the most popular type of fillers. Most people know them by their trade name Juvederm, Restylane, and Perlane. These fillers are what is also know as temporary fillers. Basically, Hyaluronic Based Fillers (HA Fillers) only last for an average of 6-12 months, though there can be no guarantee as to how long it can actually last for a patient or for a specific area. Researches show that repeated injections may help stimulate the body's own natural production of collagen therefore over time, there will be less frequent need for reinjection. There is also some evidence that less filler is needed over time to achieve the same look. Rejection or allergic reactions to HA Fillers are rare but injection can cause swelling and bruising at the injection site. The filler may also show up under the skin as tiny bumps which gradually improve over time. Polyacramide Based Fillers or what we popularly known as Aquamid or the permanent filler is a controversial type of filler. Many claim that the filler only lasts for about 5-10 years while others claim it lasts for more than that and it never changes. Aquamid had however been used in Europe for more than 30 years and like all other cosmetic products and procedures, response to the substance is very individualistic. In our more than 10years of using the product with our patients, we have seen any adverse effect of the substance. Since Aquamid is 97.5% Water and 2.5% Polyacramide, the chance of rejection is also very minimal. Aquamid is bio-compatible and during a year long study, no cases of allergy, hypersensitivity, migration, fibrosis, and/or granuloma unless related to infection. 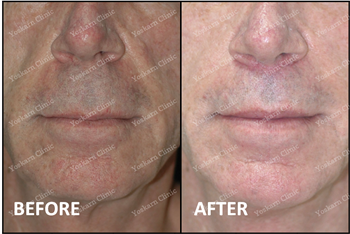 In our practice, both HA Fillers and Aquamid had been used to fill deep fold around the face that characterizes aging. Both fillers had also been used to add volume to certain areas such as the cheeks, chin, lips, and nose bridge. Though we also offer alternative procedures such as using silicone implants and fat transfer, we allow patients to do their own research, guided by our surgeon’s recommendation, before they decide which treatment mode they prefer. Since HA Fillers and Aquamid both come only in pre-filled 1mL syringes, they are often just used to fill in areas and depressions that will not require a lot of volume, like the hollowness of the lower eyelids or the depression on the nasolabial folds. Fillers are also used to correct pitted acne scars, especially those that are too deep for laser or dermabrasion. What Do You Need To Know In Choosing Which Filler Will Work Best For You? Since there are a lot of fillers available in the market with different trade names and promises, it is often confusing to choose which will be the best for you. You may have read 100s of positive reviews regarding one product, then you suddenly find one horror story about it, then you change your mind again. Generally, there is no one type of filler that will yield the best result for everyone. One factor is that we all have our body’s unique way of reacting to several substances, though years of study had confirmed this substances safe, there is always a possibility that one person will reject it, or will not react well with it in the long run because our body is unique to each individual. Another factor that you have to consider is the qualification of the injector. Yes, you may think that it’s just an injection, a 30-minute procedure, and watching your surgeon do it, you may think that you can actually do it by yourself or your friend nurse can do it for you. The thing is, there is a certain depth to which the filler should be deposited on different areas. There are veins along injections sites that you need to avoid or it would lead to very unpleasant complications. There are fillers that will work better on certain areas than on others and your injector should have this knowledge. To make the most out of your filler injection experience, you need to understand that price should be secondary when choosing the institution where you would do the procedure, even if it’s just an injection. Find a surgeon or a doctor who has enough experience in the field, and make sure to ask relevant questions regarding the procedure. Also ask about the type of filler that they will use, and why. Do your own research but keep in mind that there will always be unhappy customers so you have to weigh each review and consider that it can be true or it can be a little bit exaggerated. Most importantly, there are a lot of counterfeit products in the market. Visit only trusted facilities and don’t be shy to ask for a proof that the filler they are using is authentic. This is your right as a patient. It is also a must that you know exactly what type of filler was injected to you so that in case you want to have it removed, you have full information about it. Filler prices all over the world is almost the same, the difference in the cost of the injection itself is the fee you pay the injector and the facility so prices for fillers should not vary much so be watchful for very low offers for filler injections. What Should You Watch Out For After Filler Injection? Filler injections on the frown lines and on the base of the nose can cause a very rare complication called the nerve block wherein the filler is impeding the nerve or is injected direct to the nerve which will compromise blood flow on the area. Watch out for any sign of purplish to dark discoloration or blotchy red rashes that may appear on the site of the injection and the surrounding area. If this happens, call your doctor straight away as prolonging this may cause some serious aesthetic problems such as tissue necrosis and visible scarring. Bruising and swelling is normal around the area where the filler was injected whether it’s HA or Aquamid Filler. Lumps and bumps are also normal, usually due to the bruises caused by the injection. If after 10-14 days and the lumps are still present, you can come to our center for a follow up assessment. Itching is not normal after filler injection along with severe redness, should this incidence occur, contact our center immediately. Though allergic reactions happen very rarely, it is still possible. It is also best to wait for at least 2 weeks before contemplating on an additional injection as it takes this long for the swelling and bruising to subside and the effect to be visible. Since the human body is not completely symmetrical, there is also a possibility of slight asymmetry between the two sides of your body after filler injection.